Love murky cremes? 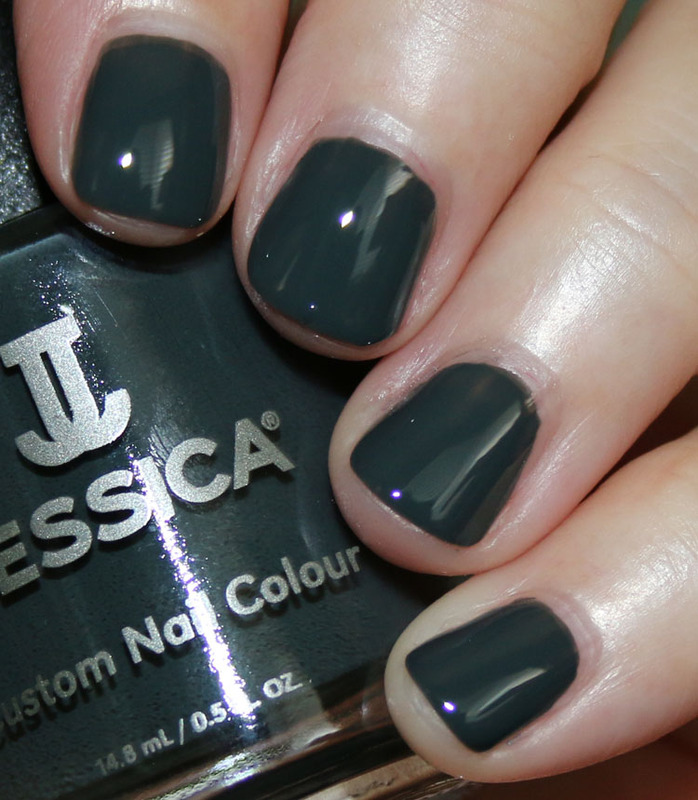 Then the Jessica Cosmetics Street Style Fall 2017 Collection might be your jam! This collection features six new shades with a murky, dusty creme finish. As the name implies, all are inspired by and named after edgy street style fashion. 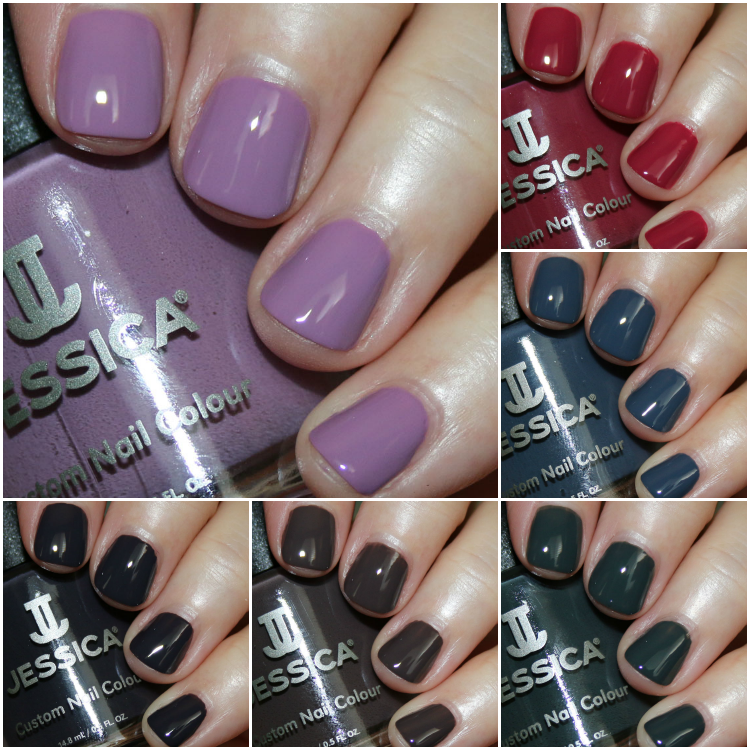 The formula was spectacular as Jessica usually is! All six of these swatched beautifully with just two coats and I had zero problems. Haute Hoodie is a dusty mauve/purple creme. Luscious Leather is a deep raspberry creme. Deliciously Distressed is a muted denim blue creme. On The Fringe is a deep forest green creme. Fab Faux-Fur is a dark cool-toned chocolate brown creme. Very Vinyl is a dark charcoal grey creme. I really love most of these colors even though they might not be completely unique. It definitely says “autumn” to me. I love murky colors and very rich looking cremes, which all of these are. The only one I felt “meh” about was Luscious Leather because I just don’t like raspberry colored anything. My faves are Haute Hoodie, On The Fringe and Very Vinyl (which doesn’t look black, by the way). You can find the Jessica Cosmetics Street Style Fall 2017 Collection now on their site. Do you have a favorite here? I like the mauve one best. I wish this brand was available in stores. I hate to pay $3-$5 in shipping just for one polish. If I’m getting several polishes it’s less of a big deal. I love everyone of those polishes and love the swatches. My favorites are Haute Hoodie, Deliciously Distressed, Fab Faux, Very Vinyl, and On the Fringe. Love the purple, blue and charcoal brown cremes just might get the whole collection. Thanks for everything you do. Haute Hoodie really stands out to me! I know there must be other colors like it out there, but it somehow looks dusty and vibrant at the same time, mega ultra heart eyes.